Spinal injury and the gradual deterioration of spinal discs that lead to back pain or spinal disorders can be treated surgically. One of the most promising surgical options under continuous development is the use of artificial discs to replace the patient’s natural spinal disc. 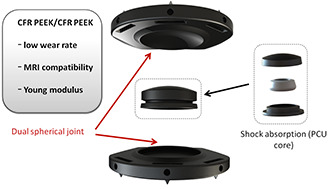 The materials used in these artificial discs are an important factor in the development of this technology. The discs must be made from materials that are safe to be implanted in the human body, do not cause allergic reactions, but also wear resistant and compatible with medical imaging (MRI for example). Fiber reinforced plastic composites are used more and more in today's orthopedic implants because of their resistance to wear and improved mechanical properties. The challenge when designing implants that take advantage of reinforced plastics is predicting the manufactured material performance. The mechanical properties of an implant designed with fiber reinforced plastics can vary widely depending on the use of the material and how the implant is manufactured. The injection or compression molding process used to manufacture the implant will affect the fiber orientations throughout the part. Typical analysis assumes the material is isotropic for simplicity, but in reality the fiber alignment is continuously changing throughout the implant, resulting in a heterogeneous, anisotropic material. Poorly aligned fibers or not appropriately accounting for the fibers’ effect on material performance can lead to a softer or stiffer implant than designed, and even premature failure. MSC Software’s Digimat produces a much more accurate prediction of the composite behavior for materials such as fiber reinforced plastics. The process is simple. Start with the same finite element model of the implant that is used for the existing analysis. 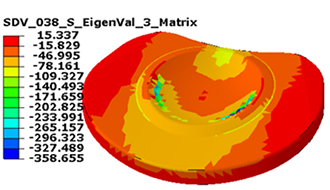 Digimat will work with any major finite element solver. Next, request the injection mold simulation results from the manufacturer. This analysis is done to assure the implant’s mold has been designed properly for manufacture, but the results can also be used in the finite element analysis of the implant itself. To do this, use Digimat to map the fiber orientations, residual temperatures and residual stresses onto the structural analysis model. 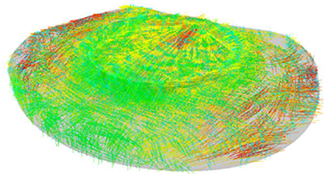 Select or create an intelligent material model of the reinforced plastic using the tools provided by Digimat. The intelligent material model is a function of fiber orientations instead of a static value, allowing Digimat to adjust the material stiffness at every location throughout the implant. Finally, conduct the analysis as normal with one exception, the static value for material stiffness will be replaced by a Digimat material model. Digimat takes care of tying the intelligent material into the analysis solution so that the analyst can focus on designing the implant’s performance, not guessing at which material property might give the best results. The attention to material details result in much more accurate simulations that reduce test/ analysis iterations and improve performance predictions. In the case of the Medicrea design, the original isotropic simulation over-predicted the implant’s stiffness by as much as 170%. 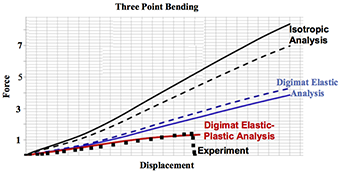 The same simulation using a Digimat material model that accounted for both changes in fiber orientations as well as plastic deformations matched the test results almost perfectly.